What Exterior Features are on the 2017 Honda Civic? The 2017 Honda Civic has been known throughout Goshen as a vehicle you can rely on that also delivers incredible style. The new model holds true to this tradition, especially when you look at the exterior. With stunning features that complement your drive, as well as those that allow you to stand out on the roadways, you’ll be extremely impressed with the multiple features and amenities the new Civic brings that will allow you to show off. From the front to the rear, the new Honda Civic is equipped with LED headlights and taillights that deliver crisp visibility throughout the roadways for more safety. When the Monroe weather gets cold, the Honda Civic and its heated/LED-indicator side mirrors will ensure you not always have the safest view but that others always know your next move. The new Civic comes equipped with a power moonroof, so you can make the cabin feel more spacious, take in the great Monticello views, or let in some of that fresh air for a more entertaining ride. Thanks to the decklid spoiler, this new model provides an athletic look that also keeps impressive efficiency for a ride you’ll never forget. Middletown Honda has a large selection of 2017 Honda Civic models for you to see and test drive today. When you want to improve, your Goshen driving experience, you’ll be sure to bring one of these new models home. 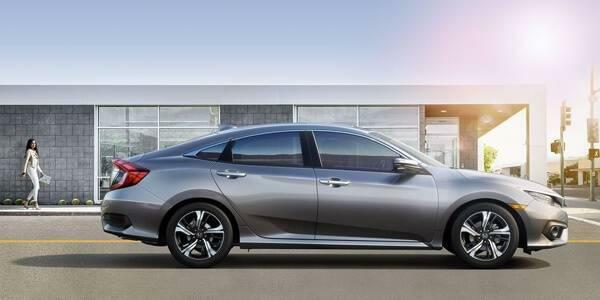 Visit Middletown Honda today, located at 520 Rte 211 E in Middletown, NY to see our inventory and test drive one today. If you’d like to learn more about our vehicle financing or vehicle specials, contact us online or by phone at (855) 473-3050.